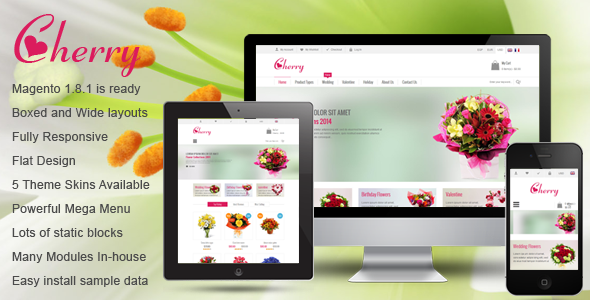 SM Cherry – a professional Theme has released with fully responsive layout. Powered by many premium extensions will make your site become stronger: Dymanic Slideshow, powerful Mega Menu, Ajax cart pro, SM Tab Listing for loading more products, Ajax cart pro for quick purchase, multi-language, multi-currency and over 10 highly customizable static blocks… SM Cherry includes everything you need to build an outstanding online website, it seems really pretty choice for all types of products, especially flowers store, clothes store, accessories store or related to bride-and-groom products… and much more depending on your setting-up. Item Reviewed: Clean Style with Flat Design Responsive Magento Theme 9 out of 10 based on 10 ratings. 9 user reviews.